I was talking to an Irish nurse recently who was describing her two years spent volunteering in a provincial Cambodian hospital, living in a building beside the hospital with no television, electricity or fridge, no pizza, wine or cheese, no internet, pub quizzes or bags of Kettle Chips from the supermarket. No cappuccinos! As we listened, simultaneously thrilled and aghast, a friend of mine commented “Oh, I see! See, you live in Cambodia. We live in Siem Reap, it’s somewhere else entirely.” Which just about sums it up really. 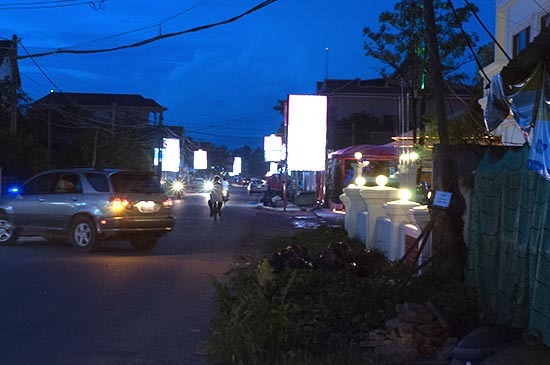 Siem Reap town isn’t really Cambodia anymore. At least, downtown Siem Reap isn’t. It’s full of foreign restaurants that are full of foreigners eating foreign food (even the ‘local’ food in the restaurants catering to foreigners is foreign, as it’s prepared with ingredients from Thailand and Vietnam), and drinking foreign drinks (apart from Cambodia’s beers, on which I really must do some extensive research for professional purposes very soon). It’s comforting in a way when Cambodia still, undeservedly, carries the mantle of being a little bit of an edgy, scary place to go, and you can’t really blame people for taking refuge in it. Cambodia’s Pub Street. See the bright lights! That will pass with time, and the sooner the better. But it’s not necessary to step onto a bus and head off for the wild hills in order to experience a little more of Cambodia as it’s lived by Cambodians. In fact, the most fun way to do that is to find a Cambodian beer garden of which there are more than many once you start to head for the city’s perimeters. 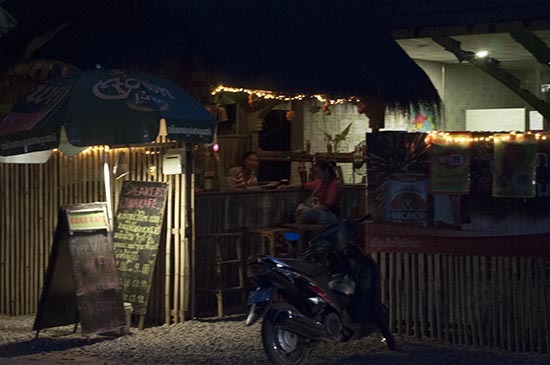 And why not head for Siem Reap’s own Cambodian Pub Street, a long road teeming with bars and restaurants, with bright lights, shockingly bad music, insanely cheap beer, and lots of young Cambodians out for a laugh. The options range from small, bamboo cabins to modern, almost American style open-plan restaurants with booths and table service. To get there, just ask your tuk tuk driver to take you up along Sivatha Boulevard to Route 6, then turn towards the airport. Then, at the first set of traffic lights, turn right and you’re there. It’s 10 minutes from Pub Street, allowing for traffic jams. From small bamboo lean-tos to big neon-lit karaoke bars. Selecting one is a matter of feel at the end of the day. Since almost all the names are in Khmer, I can’t tell you a great deal. The Triangle Club, however, is always easy to find, and most tuk tuk drivers will know what you’re talking about if you ask for it. It’s an open-plan restaurant and bar, with tables in the centre of the room and booths lining the edges. Cambodia beer costs $1.75 per jug. Yes, you read that right. A jug costs a tiny bit more, and in many cases a little bit less, than a bottle does on Pub Street. A bottle is 3,500, riel while a can is 3,000 riel. The table service includes endless top-ups of your glass and one thing you’ll learn is that Cambodians tend to drink their beer with lots of ice. It’s actually very nice, and helps to mitigate the morning horrors of course. And speaking of cures, the nurse loved her time here.